One of the highlights of the National Education Summits for the past 3 years was the Vice President’s keynote address. Participants looked forward to listening to her. This year was different and special. VP Leni set aside her written speech and spoke from the heart. She graciously shared her “front row seat” experience of how her late husband, the beloved Jesse Robredo, was as a public servant, a Mayor and an education advocate. She talked about his motivations, thought processes and the difficulties he had to be able to implement his programs. One could hear a pin drop as the roomful of more than 600 people was all ears on the VP the entire 36 minutes of her talk. Vivid images of Mayor Jesse at work must be playing in their minds. According to VP Leni, earning the trust of City Hall and of his constituents was the first difficulty faced by Mayor Jesse. After all, he was a young man at 29 when he got elected as Mayor of Naga right after the People Power Revolution. Mayor Jesse was firm in introducing changes because he believed in his goal to instill professionalism in the city hall. He set up a bundy clock and required everyone to clock in and out. He implemented diagnostic examinations to determine staff competencies. He led by example. “I cannot ask of anyone something that I cannot do myself,” was what Mayor Jesse used to tell his wife. Since everyone was required to come to work on time, Mayor Jesse made sure he was the first one to arrive at the City Hall. He would be at the office at 7 AM each day. For Mayor Jesse, this gave him the moral authority to demand professionalism from his employees. 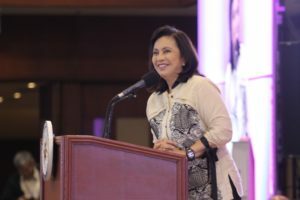 VP Leni recalled that Mayor Jesse was fixated on symbols because of the messages they evoke. He associated a broken street lamp to inefficiency of the city government. Thus, he checked all street lamps every night to make sure all were lighted. When he saw trash on the street which was not due for pick up, the staff in charge of the area got a demerit. He was the last man on the street before a typhoon, and the first man on the street after a typhoon, to clean the debris, even when storm winds died down at 1 or 2 am in the early morning. He wanted the vestiges of the typhoon gone when his constituents wake up at daybreak. VP Leni went on to explain that, through the years, the principles of Mayor Jesse on governance became defined. These principles were on Accountability, Participation, Predictability, Transparency and Empowerment. In all the programs that Mayor Jesse implemented, all these principles had to be integrated. These principles were evident in the implementation of his education programs. The program called “Educare” for 3-5 year olds in the daycare centers was enriched with Montessori teaching strategies to really prepare young children for primary school. Even teacher-volunteers were also given training, including opportunities to finish college, to enhance the quality of learning in daycare centers. For sustainability, barangays were mandated to allocate a budget for daycare centers. As a result, from 30, there are now more than 100 daycare centers all over Naga City. VP Leni proceeded to describe the other programs of Mayor Jesse. The Sanggawadan (Bicol term for “to extend a helping hand), the expanded Sanggawadan program which is called Quality Universal Elementary Education (or QUEEN) and the QUEEN Plus programs provided incentives to parents to keep their children in school. They looked like predecessors of the 4Ps program. Incentives included free rice and school supplies, or free school fees. Parents were also asked to attend school meetings. Eventually, they became more involved in their children’s education and more empowered citizens of the community. A nutrition program was implemented to ensure that children were properly nourished while in school. They worked with targets. Malnutrition was almost 30% when Mayor Jesse started. It went down to 6.7% when the nutrition program was started. By 2015, the rate went down further to 3.35%. Their target now is 0% but their challenge is Naga’s increasing population due to in-migration. VP Leni mentioned Mayor Jesse’s initiative to reinvent the Local School Board by expanding its membership. He felt that what was not prevented [by the law] was allowed. Again, with the benefit of hindsight, VP Leni said Mayor Jesse was correct. With the expansion of the LSB, the programs became more revolutionary because more voices were being heard. It was an empowerment tool to include in the LSB the other sectors of society who really have a stake in the education of the children.